Environmental Change: Adoption of healthy school food environments, education in school communities about how and why to eat healthy food grown close to home and support for initiatives that increase this food access. Network-Building: Alignment, connection, strategy sharing, and action across a robust network of regional partner organizations, assistance for members of that network to be effective advocates for the development of resilient local food systems. Leadership Development: Growing cadre of young leaders who will fill or create the civic and professional roles needed at every level to support a healthy food system statewide. One of the ways that we seek to reach these goals is by providing opportunities for Montana youth to get engaged in food systems related work in their own communities. At Growing Leaders, we tend an ever expanding list of youth based opportunities that fit our objectives and want to make it accessible to all. Follow this link to view our current list of opportunities, and please contact Demetrius Fassas at demetriusf@ncat.org or 406-494-8672 if you’d like to add or change anything on the current list. What are the Growing Leaders Youth Initiatives? Gear-Up for the 2015 Growing Leaders Youth Summits!! Help make change through NCAT’s Youth Summits! Are you passionate about promoting the health and prosperity of your community? Are you a community member who loves local, nutritious food? Help us create a unique experience for the future leaders of Montana by sharing your knowledge and experience through a presentation or workshop. This year, we are having FIVE Regional Growing Leaders Youth Summits for students to explore local food systems across the state! Register for the 2015 Summits Here! Interested in the 2015 Growing Leaders Youth Summits? For Students in the following Counties: Ravalli, Deer Lodge, Powell, Lewis and Clark, Silver Bow, Jefferson, Broadwater, Beaverhead, Madison, Gallatin, Broadwater, Park, Sweetgrass, Judith Basin, and Wheatland. Demetrius Fassas is thrilled to be working with NCAT’s Growing Leaders Youth Initiatives in Butte to plan and facilitate the Youth Summits this year. You may have met him at the 2013 Growing Leaders Youth Summit, when he was serving as a FoodCorps Service Member in Ennis, MT. After graduating from Butler University with a B.S. in Biology and Chemistry 2.5 years ago, Demetrius moved out to Montana in search of a healthier life complete with good food, breathing room, grateful people, and great outdoors. He’s found all that and so much more as life continues to unfold with beautiful opportunities. Demetrius is pleased to be playing this role in coordinating this year’s Growing Leaders programming, and hopes to personally connect with each person who has a desire to share in the process. YOU SPOKE, WE LISTENED!! In response to the number of folks that were unable to attend the 2013 Summit because of the traveling distance involved, this year, we will be having FIVE Regional Growing Leaders Youth Summits. Kalispell, Helena, Livingston, Billings, and Havre are the target cities where we would like to organize Summits. The expected dates are in October and November, giving us a solid four more months to shape up some awesome opportunities that will build high school students’ sense of leadership and capacity to educate and organize their peers and communities around healthy eating and living. This is no small task, and we can’t do it alone, WE NEED YOUR HELP! The National Center for Appropriate Technology (NCAT) is looking for help, first and foremost in finding partner organizations that might be willing to host such a gathering in your region. If you have any thoughts on such a host organization or want more information in regards to what we are looking for, please contact khalloran@ncat.org. Because we got such great feedback from the 2013 Youth Summit, we want to reach out you all again for your input on workshop topics, speakers, and field trips that you would like to see at the 2015 Summits. So, add your ideas in an email and they will be introduced in our next planning meeting. Do you love real good food, working with young people, lifelong growth and education; have you ever wanted to promote the health and prosperity of your fellows? Events like these take a team effort to create. If you’re interested in being a part of the steering committee that makes the magic happen in your region, please send your contact information and location to khalloran@ncat.org to get plugged in and involved in creating change today! Congratulations Local Harvesters Claudia Wiese, Helen Hartley, Sarah Brown, Carolyn Graham, Annie Little Broberg, and Francie Lorenzen for hosting the Hellgate Rooftop Salsa Party on Wednesday, October 8 in Missoula in celebration of National Farm to School Month. Check out the front page feature in The Missoulian. Well over 100 students munched on chips and local salsa made in part from ingredients grown by the S.A.V.E. club members in Hellgate’s rooftop garden. They were joined by Hellgate principal Lisa Hendrix, faculty, staff, parents, and community members including MCPS K-12 Trustee Diane Lorenzen. Party goers had the opportunity to hear from the Local Harvest youth planning committee about their experience preparing for the event, learn about local food from FoodCorps service member Amy Harvey, play Local Food Bingo with prizes from local businesses, and plant their own garlic clove (grown by Local Harvester Sarah and her sister Alice) in a biodegradable repurposed newspaper pot in soil donated by Garden City Harvest. Everyone at the Montana Healthy Food and Communities Initiative is thrilled to have helped make this event happen through the Growing Leaders Local Harvest Event Grant, which provided funding, training, and support. 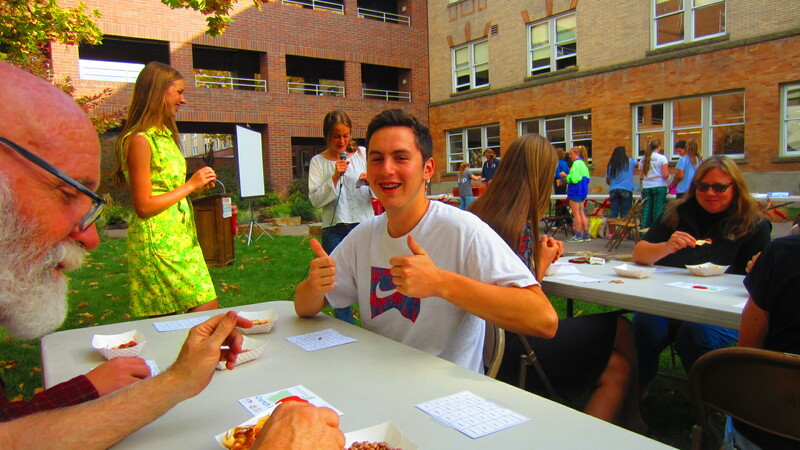 The Rooftop Salsa Party was the second of two Local Harvest events to take place in fall of 2014 as part of this new Growing Leaders youth initiative. 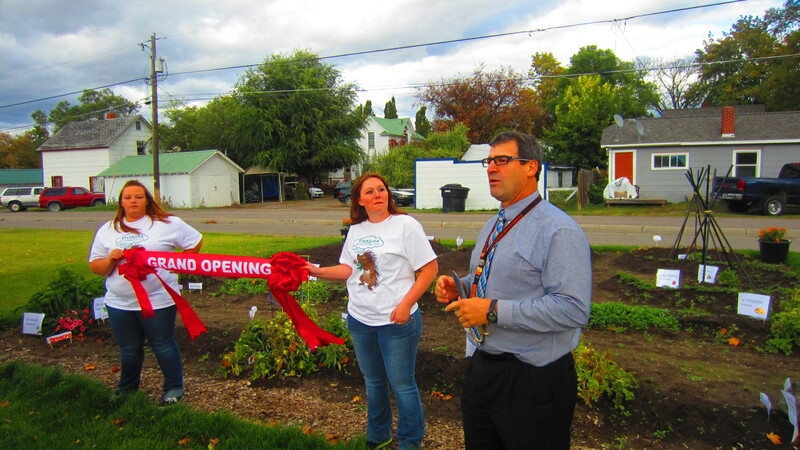 Click here to read about the first event, Flathead High School’s grand opening of the Growing a Better World garden. And a big shout out to Hellgate High School teacher Lee Brown for providing guidance and support for these youth throughout veggie growing and event planning. His efforts are building the soil in which these young leaders are growing! Check out the front page feature in The Missoulian. NCAT’s First Local Harvest Event a Success! 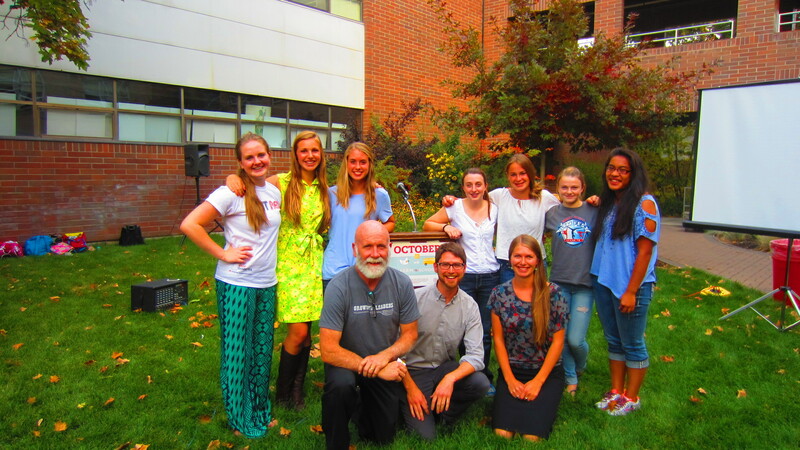 Congratulations Local Harvesters Hannah Whipkey, president of the Flathead High School Environmental Club, former vice-president Katy Dutton, and the rest of the club’s members for starting the Growing a Better World garden at FHS and for hosting an awesome garden opening party on Wednesday, October 1, 2014 in Kalispell, MT! Click here to read the article in the Daily Interlake. The party was attended by about 40 students and community members including Kalispell School District Food Service Director Jenny Montague, Flathead High School Principal Peter Fusaro, and Kalispell School District Superintendent Mark Flatau. 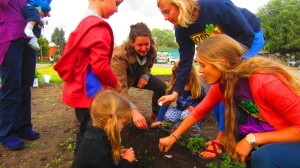 Kids of all ages participated in planting garlic, Garden Jeopardy, face painting, and sampling a variety of local foods. Everyone at the Montana Healthy Food and Communities Initiative is thrilled to have helped make this event happen through the Growing Leaders Local Harvest Event Grant. 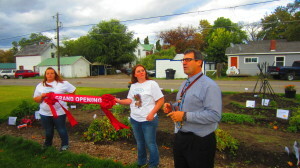 The grand opening party was the first of two Local Harvest events to take place in fall of 2014 as part of this new Growing Leaders initiative. The second, the Rooftop Salsa Party, will take place at Hellgate High School on Wednesday, October 8 in Missoula. And a big shout out to Flathead High School teacher Amanda Matdies for providing guidance and support for these youth throughout garden planning and event planning. Her efforts are building the soil in which these young leaders are growing! Click here to read the article in the Daily Interlake. The National Center for Appropriate Technology (NCAT) announced the recipients of the 2014 Local Harvest Event Grant on June 11, 2014. Grants were awarded to two youth-led teams to support events that intend to build awareness about local food in two Montana communities: the Grand Opening of Growing a Better World Garden at Flathead High School in Kalispell and the Rooftop Salsa Party at Hellgate High School in Missoula. While unique, the events both feature an important shared community asset: their high school garden. 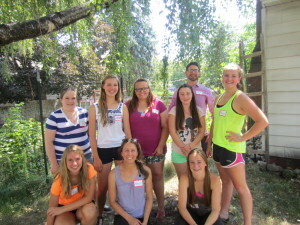 In July, members of each team’s Youth Planning Committee gathered in Missoula for a day-long Local Harvester Training. Jeremy Drake, NCAT Project and Evaluation Specialist and coordinator of the Growing Leaders Youth Initiatives, led the youth through a series of activities to help them build camaraderie, understand cooperative teamwork, and gain skills relevant to event planning. Topics included refining their event planning timeline, defining their youth-led activities, getting the word out, and measuring the impact of their event. The team that submitted the proposal from Flathead High School in Kalispell was spearheaded by two students, a junior and a senior, who attended NCAT’s Growing Leaders Youth Summit in Missoula last October. Inspired by what they learned at the summit, the young leaders formed “The Environmental Club” and set out to grow a garden at their school that could eventually provide fresh produce for school meals. 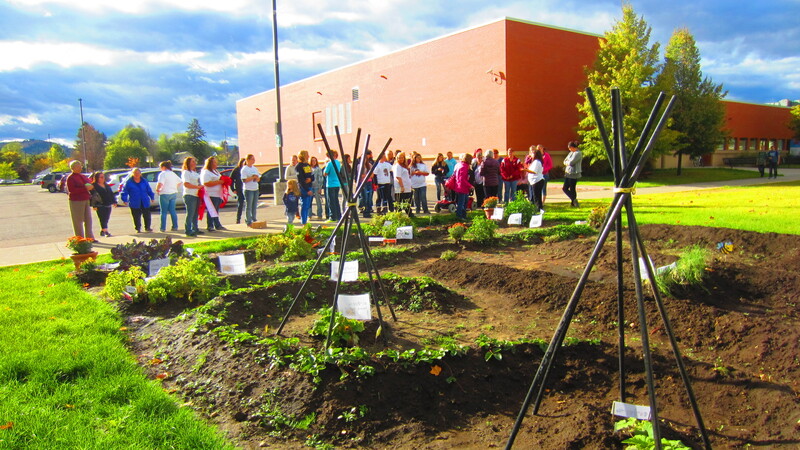 Less than a year later, Flathead High School’s Growing a Better World Garden has taken root and members of the club are preparing for the Grand Opening this fall. The event will be open to the community and will feature fresh local foods, guest speakers, and youth-led, food-focused educational activities and games, as well as a ceremonial ribbon cutting. 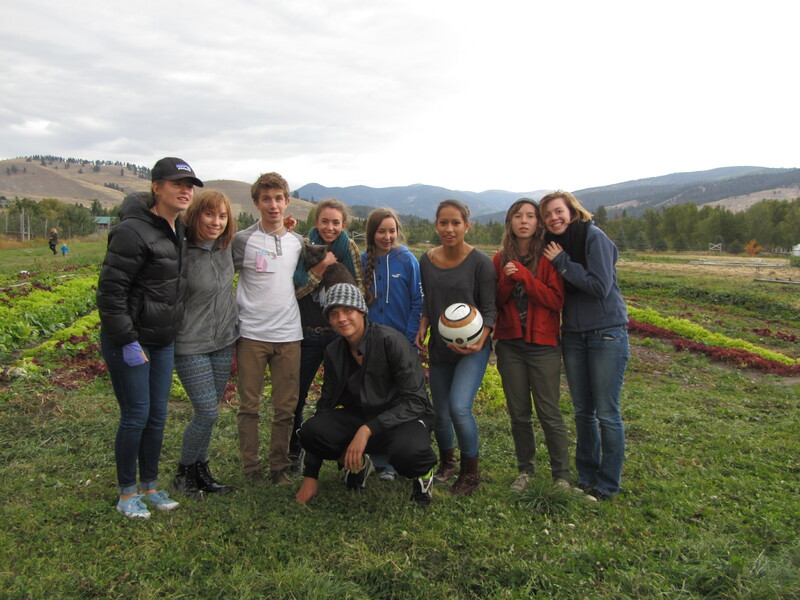 The team that submitted the proposal from Hellgate High School in Missoula was spearheaded by a group of 9th graders excited about local food and school gardens. Salsa Party seeks to build upon the popular “Salsa Day” event that Hellgate’s Students Against Violating the Environment (S.A.V.E.) club started three years ago as a way to promote the rooftop garden. 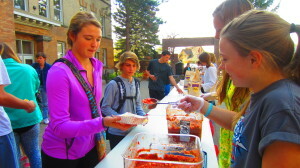 Salsa Party will bring Hellgate students and community members into the rooftop garden to eat salsa prepared from ingredients grown in the garden. The event will feature youth and adult guest speakers, informational posters and handouts, and engaging youth-led activities including a healthy eating game. Over 100 high school students, educators, and activists converged in Missoula October 6-8, 2013 for the Growing Leaders Youth Summit to plant big ideas about how to diversify the future of food. 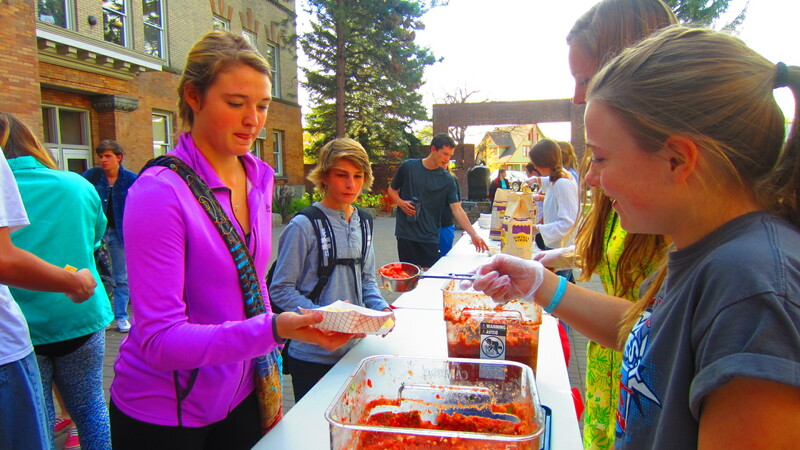 It was the largest event of its kind in Montana and showed that a #YouthFoodRevolution is gaining momentum in Big Sky country. 2013 Growing Leaders Youth Summit – THE MOVIE! This video highlights the youth-led activities, hands-on learning, inspiring voices, creative expression, and good local food featured at the summit. Victoria Pozos Bernal, a Food, What?! alumna from Watsonville, CA, spoke about her experience growing up the daughter of a farm worker and the role it played in her transformation from summertime raspberry picker to full-time food justice activist. Three guest speakers from across the U.S. talked about the work they are doing to create more just and accessible food systems in their communities: Scarlett Kaplan, S.A.V.E. Club at Hellgate High School in Missoula, MT; Ayisah Yusef, Rural Coalition in Washington, DC; Phil Nguyen, The Food Project in Boston, MA. Gerardo Marin, co-director of Rooted in Community from Berkeley, CA, spoke about the role of art in the youth food movement and about the power that beauty and culture can bring to activism. Bob Marshall, owner of Biga Pizza in Missoula, MT, award-winning chef, and in this clip at least, comedian, cracked us up after serving up delicious pizzas featuring veggie toppings grown at PEAS Farm and spoke about the 3 reasons he sources locally grown foods for his restaurant. Josh Slotnick, Director of PEAS Farm in Missoula, MT, made us think about the effects of a global food system in which the cost is cheap but the price is high and spoke about the culturally regenerative power of creating local alternatives. NCAT is home to the Growing Leaders Youth Initiatives – a program that works to support the active involvement of youth in Montana’s Food Systems by strengthening young people’s capacity to educate and organize their peers and communities about healthy eating, healthy living, and vibrant community-based food systems. Growing Leaders Youth Initiatives are brought to life by generous support from the Foundation for Healthy Montanans.